It's been itching to blow since September and it's finally erupted! Bali's Governor tried to reassure worried locals that all measures were in place to cope with a possible eruption which has finally come to pass. Mount Agung on the resort island of Bali, which has been rumbling in recent months, erupted on Tuesday afternoon, the nation's disaster mitigation agency said. 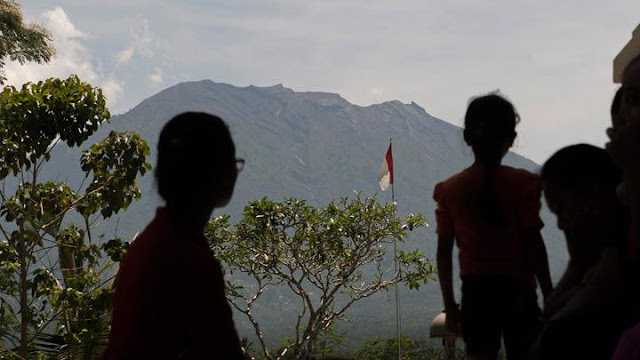 The volcano erupted and spewed black smoke at 5:05 p.m. on Tuesday, said Sutopo Purwo Nugroho, the head of the National Disaster Mitigation Agency (BNPB). "Residents are advised to remain calm. Do not panic. Stay away from areas within a 6-5/5 kilometre radius of the volcano," he said on his Twitter account. The Energy and Mineral Resources Ministry's Volcanology and Geological Hazard Mitigation Center (PVMBG) said in a statement that the height of the smoke reached more than 700 meters from the peak of the mountain. "The eruption is still ongoing. Residents should remain calm and follow the PVMBG's recommendations," it said. The alert level for the rumbling volcano that had forced more than 150,000 to flee was lowered late last month, though authorities said there was still a chance it could erupt. Volcanic activity on Mt. Agung had been slowing and the volcano's status was lowered from the highest level, danger, to the third highest level, alert, by the volcanology centre.